Robben Island (Afrikaans Robbeneiland) is an island in Table Bay, 5 miles (8 km) off the coast of South Africa, approximately 6 miles (10 km) north of Cape Town. Its name comes from the Dutch Robbe Eiland, meaning "seal island." Initially a stopping point for passing ships in the sixteenth and early seventeenth centuries, there were several attempts at settlement. When these proved unsuccessful, the island became a penal colony and eventually a place of exile for the ill, including use as a leper colony. The island is perhaps best known for its role as a political prison during the days of South African apartheid. It was here that Nelson Mandela penned a large part of his autobiography, Long Walk to Freedom, during his 18 year imprisonment. While the island was used as a place where men were sent to have their spirits broken, it instead came to symbolize the ability of the spirit to prevail over enormous hardship and adversity. In 1997, the prison was turned into a museum and declared a national monument. Robben Island was designated a cultural World Heritage Site in 1999, five years after the official demise of apartheid, based upon UNESCO's determination that; "The buildings of Robben Island bear eloquent testimony to its sombre history." and "Robben Island and its prison buildings symbolize the triumph of the human spirit, of freedom, and of democracy over oppression." Robben Island lies 5 miles (8 km) off the coast of South Africa in Table Bay. Roughly oval shaped, the island is about six-tenths of a mile (one kilometer) in width, with an approximate area of 5 square miles (13 square km). West of the mainland, it is approximately 6 miles (10 km) north of the city of Cape Town. The name Robben Island comes from the original Dutch name, Robbe Eiland, meaning "seal island." At the time of European discovery in the late fifteenth century, seals were plentiful, as were penguins, tortoises, birds, and sea mammals. Whales surrounded the island in early spring, while lobsters and shellfish were found along the shoreline. Cormorants on breakwater on Robben Island. Today, there are approximately 132 bird species, including seabirds, waterbirds, and terrestrial birds. While some are naturally occurring, others, such as the Chukar Partridge and Guinea Fowl, were introduced by humans. The Island's environment provides a sheltered haven for this large variety of bird species, some of which are endangered. The crowned cormorant and black crowned night herons, who live principally on the mainland, breed on the Island in large colonies. There are 23 mammal species that make their home on the Island, including small herds of bontebok, springbok, steenbok, fallow deer, and eland. The antelope were introduced around 1960, by the island's prison warden, who also brought giant tortoises. Ostriches, lizards, geckos, and snakes also live on Robben Island. The African penguin was abundant in the seventeenth century but had become extinct on the island in the 1800s through human activities. By 1983, they had been successfully re-introduced and have since established themselves as a breeding population. The island, the summit of an ancient, now submerged mountain, is flat and low-lying, with the highest point being approximately 80 feet (24 meters) above sea level. The highest point is known as Minto's Hill, and is named after a nineteenth century Surgeon-Superintendent of the General Infirmary. It is composed of Precambrian metamorphic rocks belonging to the Malmesbury Group. Above this shale is a thick limestone and calcrete deposit covered by windblown sands and shell fragments. Similar to nearby Cape Town, the climate is Mediterranean, but Robben Island experiences stronger winds and comparative extremes in temperature. 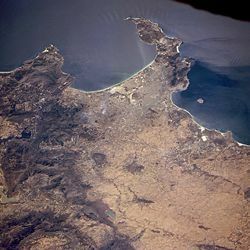 Cape Town, False Bay (top) and Table Bay with Robben Island (right) from space, February 1995. Robben Island was first inhabited thousands of years ago by stone age people, at a time when sea levels were considerably lower than they are today and people could reach the area on foot. Toward the end of the last Ice Age the melting of the ancient ice caps caused sea levels to rise and the land around the island was flooded by the ocean. Robben Island is believed to have been discovered by Europeans, in 1488, when Bartolomeu Dias anchored his ship in Table Bay. For the next century it was used by British and Dutch colonialists and traders as both an outpost and prison. By 1591, many people of the Khoikhoi tribe used the island as refuge from the fast encroaching European settlements on the mainland. Jan Van Riebeeck, of the Dutch East India Company, arrived on the Cape in 1652, and used the island as a vital refreshment station. Many in the company feared entering the continent, preferring to land on Robben Island to hunt seals, penguins, and tortoises. By 1654, Riebeeck had his men live and work on the Island, where they hunted and mined stone. Soon leaders of native resistance groups to Dutch settlers became prisoners on the island. The first political prisoner was Autshumato, who was exiled to the Island in 1658. He is one of the few prisoners known to have escaped successfully. By the late 1600s, a new group of prisoners arrived on the Island—political leaders of anti-Dutch governing in the East Indies, many of them former indigenous rulers such as kings, princes, and religious leaders. In 1795, the British claimed the southern tip of Africa and began using Robben Island as a penal colony. Army deserters, murderers, thieves, and political prisoners, and eventually many Xhosa captives, were taken to the island. Robben Island gradually evolved into more of a hospital, and by the mid 1800s, was populated by the mentally ill, lepers, diseased people, and the impoverished. However, there was actually no medical treatment available on the island and the sick received the same treatment as the prisoners. It had essentially become a dumping ground for those considered undesirable. Eventually the "lunatics" were separated from the rest of the island population, while blacks and whites were further separated. In 1892, the lepers organized a protest against the harsh conditions imposed by the British. Additional troops were sent to put an end to the uprising, and the main spokesperson, Franz Jacobs, was forced to recant his allegations of harsh treatment. Within several years, the conditions for the lepers improved and they were allowed visitors and mail and the buildings in which they resided were renovated and repaired. During the 1930s, the island's lepers were sent to hospitals on the mainland and all the buildings were burned to the ground to prevent the spread of disease. The population of the island fell from several thousand to a handful of caretakers and lighthouse keepers. Just prior to World War II, South Africa's military took control of Robben Island. They housed some of the country's most advanced weaponry and built secure roads, an improved water supply system, a new power station, and rows of modern houses. Though it had become a military post, by 1961, it resumed its role as an island penitentiary. Gate to Robben Island prison. Nelson Mandela's prison cell on Robben Island. In 1961 the Prisons Department of South Africa took over the island and built an austere maximum-security prison. It served as such for political prisoners from 1960 through 1991, and as a medium security prison for criminal prisoners from 1960 through 1996. Between 1961 and 1991, over three thousand men were incarcerated on Robben Island, often for decades, perhaps the most well-known being Nelson Mandela. It was here that he penned the bulk of his autobiography, Long Walk to Freedom. During the apartheid years, Robben Island was notorious for its institutional brutality. Initially political and common-law prisoners were housed together, though in 1971, the political prisoners were further isolated and remained so until the prison closed. Contact with the outside world was limited to sending and receiving two letters per year. When prisoner family member visits were instituted, they were restricted to once every six months for a period of only thirty minutes, in conditions which made even conversation difficult. Security was very tight and the island was off-limits to almost all civilians, including fishermen. Before about 1980, almost no one, even among inhabitants of Cape Town, had set foot on the island. It is not generally known that the use of the island was greatly inhibited for centuries by a lack of fresh water. The island is arid, with low scrubby vegetation and has no watercourses. Boreholes were drilled in the first half of the twentieth century, but in due course the fragile water table was invaded by sea water and the bores became useless. Sometime after 1965, a pipeline was laid on the bottom of the ocean connecting the Island to Cape Town. Life on Robben Island during these years more closely resembled a labor camp than a prison. Breaking rocks and mining lime from the Island's quarry were required. Beatings and prolonged solitary confinement were commonly practiced. Food, bedding and clothing were insufficient. In the early 1980s, many prisoners engaged in active demands for rights, and a 1981 hunger strike reinforced their case and, along with international pressure, led to some minor improvements in conditions. 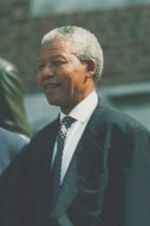 The South African government under President Frederik Willem de Klerk released Nelson Mandela from prison on February 11, 1990, to worldwide acclaim. That June, he initiated the removal of remaining political prisoners, and most were released by May 1991. The island continued to serve as a medium-security prison for criminal offenders until 1996, when they were transferred to mainland prisons. Most inmates had been black men incarcerated for political offenses. Some of them spent more than a quarter of a century in prison for their beliefs. The duty of those who ran the island and its prison was to isolate opponents of apartheid and to crush their morale. The particular character of the apartheid era prisoners, and their disciplined morale in the face of considerable difficulties and even abuse, is well attested as being sustained by their commitment to the cause of the struggle for freedom, in particular for the majority black African population. Robben Island came to symbolize the triumph of the human spirit over enormous hardship and adversity. Today when I look at Robben Island, I see it as a celebration of the struggle and a symbol of the finest qualities of the human spirit, rather than as a monument to the brutal tyranny and oppression of apartheid. It is true that Robben Island was once a place of darkness, but out of that darkness has come a wonderful brightness, a light so powerful that it could not be hidden behind prison walls. In 1997, the prison was turned into a museum and declared a national monument. In 1999 it was declared a World Heritage Site by UNESCO. Nelson Mandela spent 18 years imprisoned on Robben Island, where he wrote the bulk of his autobiography, Long Walk to Freedom. 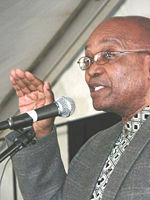 Jacob Zuma, President of the ANC, former Deputy President of South Africa (1999 to 2005). He served 10 years in Robben Island as a political prisoner. Robben Island as viewed from Table Mountain. Robben Island and its properties are owned by the government, with the exception of the island church which is no longer in operation. UNESCO designated Robben Island a cultural World Heritage Site in 1999, five years after the official demise of apartheid, noting that, "The buildings of Robben Island bear eloquent testimony to its sombre history," and "Robben Island and its prison buildings symbolize the triumph of the human spirit, of freedom, and of democracy over oppression." Today the island is a popular tourist destination, reachable by ferry from the Victoria & Alfred Waterfront in Cape Town. The former prison is now the Robben Island Museum. Tours of the Island and the prison itself are led by guides who were formerly wardens or prisoners there. The lighthouse on Minto Hill (formerly known as Fire Hill), the highest point on the island. It is where Jan van Riebeeck first set a navigation aid. Huge bonfires were lit at night to warn VOC ships of the rocks which surround the island. The current Robben Island lighthouse, built in 1863, is 60 feet (18 meters) high and was converted to electricity in 1938. It is the only South African lighthouse to utilize a flashing light instead of a revolving light, which can be seen from 15 miles (25 km) away. The Moturu Kramat, a sacred site for Muslim pilgrimage on Robben Island, was built in 1969, to commemorate Sayed Abdurahman Moturu, the Prince of Madura. Moturu, one of Cape Town's first imams, was exiled to the island in the mid 1740s and died there in 1754. Muslim political prisoners would pay homage at the shrine before leaving the island. The island had 118 residents in March 2008, mainly former wardens and their families along with others who maintain the properties. It has been described as a lonely place, cut off from the outside world, ironically, "like a prison." A Touch of Mandela. Timeline of Robben Island. Retrieved August 20, 2008. Buntman, Fran Lisa. 2003. Robben Island and Prisoner Resistance to Apartheid. Cambridge: Cambridge University Press. ISBN 9780521537681. Encyclopædia Britannica Online. 2008. Robben Island. Retrieved August 20, 2008. Maharaj, Mac, and Nelson Mandela. 2002. Reflections in Prison: Voices From the South African Liberation Struggle. Amherst: University of Massachusetts Press. ISBN 9781558493421. Mangena, Isaac. March 17, 2008. Robben Island "a lonely place." News 24.com. Retrieved August 20, 2008. Robben Island Museum. Homepage. Retrieved August 20, 2008. Zuma, Jacob. June 13, 2001. UWC Mayibuye Robben Island Archives. South African Government. Retrieved August 20, 2008. This page was last modified on 14 July 2015, at 15:27.